Our newest member - and boy is she a beauty. So hard to capture the amazing effect of the gold foil on top of this gorgeous foliage indulgent wreath. The combination is breath-taking, it all just fits in perfectly and really adds that edge of complete glamour. Rustic chic doesn't really get any better! 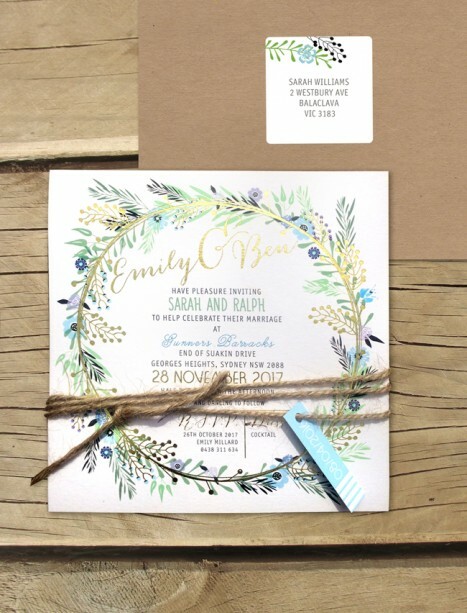 Seen here in blues and golds but we can make this wedding invitation design any colour, pinks, lilacs or a mixed palette would all look stunning. Similarly we can change the gold foil to silver, rose gold, copper or a huge variety of other options! We can change the envelope to any colour as well. It's truly a show stopping invite, the intricate foil work really sparkles. Again, no justice is done here so order a sample to behold its beauty first hand. Printed on a super thick lush card stock - with the gold foil leaving an impression into the fluffy paper - this is top notch. The foiling is our most expensive product - as each job has a special shell made for it, the technique is so specialised and we haven't skimped on anything here - but the product, is simply divine. Your names in the foil literally sparkles, just so pretty. All of our designs come with matching stationery items, rsvp cards, placecards, wishing wells etc - these designs are just so new they aren't up yet but please email us for pics and prices. We are in the process of updating our site but unfortunately getting your guests names printed isn't an option on our foiled designs. We recommend leaving a space to hand write them or writing 'you', unfortunately it's the result of the plate getting made each time. But if you want the names we can look at doing a little swing tag with guests names on there - get in touch for more details.